DAVID CHARLES POYER was born in DuBois, PA in 1949. He grew up in Brockway, Emlenton, and Bradford, in western Pennsylvania, and graduated from Bradford Area High School in 1967. He graduated from the U.S. Naval Academy at Annapolis in 1971, and later received a master's degree from George Washington University. Poyer's active and reserve naval service included sea duty in the Atlantic, Mediterranean, Arctic, Caribbean, and Pacific, and shore duty at the Pentagon, Surface Warfare Development Group, Joint Forces Command, and in Saudi Arabia and Bahrain. He retired in July 2001. 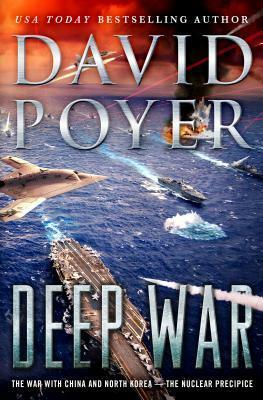 Poyer began writing in 1976, and is the author of over thirty books, including THE MED, THE GULF, THE CIRCLE, THE PASSAGE, TOMAHAWK, CHINA SEA, BLACK STORM, THE COMMAND, THE THREAT, KOREA STRAIT, THE WEAPON, and THE CRISIS, best-selling Navy novels; THE DEAD OF WINTER, WINTER IN THE HEART, AS THE WOLF LOVES WINTER, and THUNDER ON THE MOUNTAIN, set in the Pennsylvania hills; and HATTERAS BLUE, BAHAMAS BLUE, LOUISIANA BLUE, and DOWN TO A SUNLESS SEA, underwater diving adventure. Other noteworthy books are THE ONLY THING TO FEAR, a historical thriller, THE RETURN OF PHILO T. McGIFFIN, a comic novel of Annapolis, and the three volumes of The Civil War at Sea, FIRE ON THE WATERS, A COUNTRY OF OUR OWN, and THAT ANVIL OF OUR SOULS. His work has been published in Britain, translated into Japanese, Dutch, and Italian, recorded for audiobooks, 1Pod downloads, and Kindle, and selected by the Literary Guild and Doubleday Book Club. Rights to several properties have been sold or optioned for films. Poyer has taught or lectured at Annapolis, Flagler College, University of Pittsburgh, Old Dominion University, the Armed Forces Staff College, the University of North Florida, Christopher Newport University, and other institutions. He has been a guest on PBS's "Writer to Writer" series and on Voice of America, and has appeared at the Southern Festival of Books and many other literary events. He teaches in the MA/MFA in Creative Writing program at Wilkes University in Wilkes-Barre and is a board member of the Library of Virginia. He lives on Virginia's Eastern Shore with his wife, novelist Lenore Hart, and their daughter.